Jill, take a bow. You were the first to alert me to the broken link to the Walking Tour. It’s fixed, enjoy! For anyone looking for an easy way to get there, click on the Picture-Purrfect link above. Enjoy! 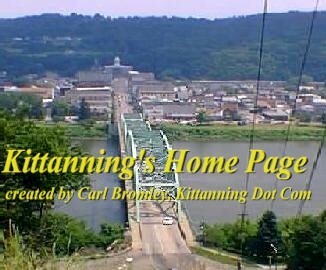 Welcome to Kittanning.com. The links below will lead you to the site favorites except for the Message Board. Another passion of this Kittanning guy is the Local4All website where you can add your USA event, nonprofit or business to our local directories, check HERE. You can even create custom Google maps to help visitors find their way around western PA. An example: the War Memorial Wall is m37.local4all.com.